From the JC for Men Collection. Santo. This is the fragrance that started the whole line. 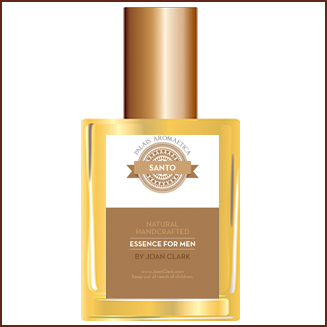 Santo is our handsomely romantic fragrance. It is a sweet, warm, woodsy fragrance with its own softness. It merges into the skin beautifully and leaves an afterglow of Peru Balsam and Rosewood with a hint of Spruce. Contains: Black Spruce, Vetiver, Petigrain, Rosewood and more.